Something new this year to wrap up Summer! Download our "Electronic Showbill" to post on websites & blogs by clicking here. Download a copy of our poster and print it out by clicking here. 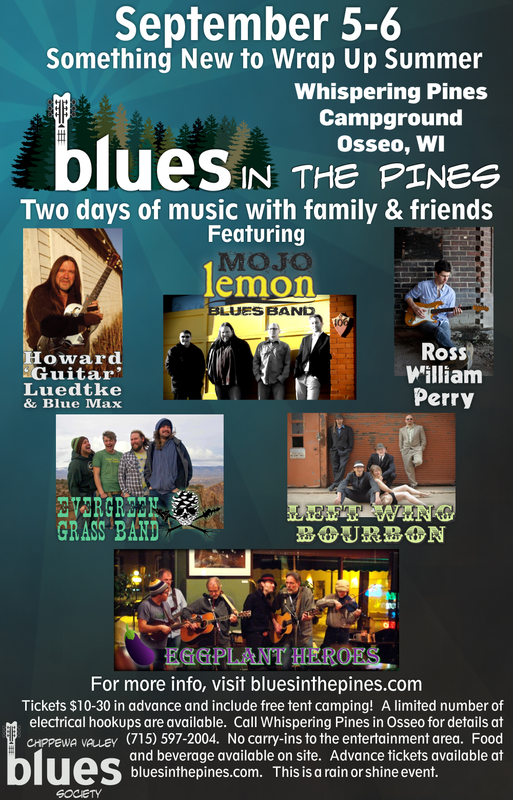 Come enjoy the beautiful outdoors and enjoy a unique evening of music kicking off with the Evergreen Grass Band. Following them, we'll feature a band that blends funk, soul, Blues and all around great times. Left Wing Bourbon! Kick off the day with the acoustic music of Eggplant Heroes, followed by Ross William Perry and Howard 'Guitar' Luedtke & Blue Max. Wrap up the day's entertainment with the Chippewa Valley's best Blues band 2008-13 as selected by the readers of Volume One; the mighty Mojo Lemon! Since you're coming for one day, why not just stay for both? Bring your family & friends for one last weekend under the stars. You'll be able to take in two days of entertainment for what you'd pay for JUST a campsite at most grounds alone. All ticket prices INCLUDE free parking and free tent camping. A limited number of full RV hook-ups are available. Call Whispering Pines for details at (715) 597-2004. No carry-ins to the entertainment area. Food and beverage will be provided on site. This is a rain or shine event. All ticket sales are final.